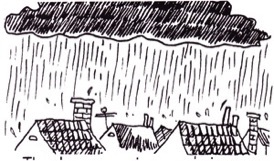 When the rain comes is your home safe from leaking? Anyone who has ever had a leak around their chimney will tell you that the damage can spread in a short period of time. Symptoms of a leaking chimney can show up in many different ways depending on the cause. Water that enters around the outside of the flashing (the metal that "frames" your chimney around the roof line) can follow the chimney down, causing damage to drywall and wallpaper and creating a major mess in no time at all. Making sure the flashing is in good shape and / or fixing it will usually cost less than the potential damage. Moisture that drips down into your chimney or stovepipe mixes with residue in the chimney flue. This moisture may not immediately cause damage, but over time it may deteriorate mortar, rust a fireplace damper or cause stovepipe to rust. lnstalling a quality chimney cap or chimney cap/top damper combination will help prevent this type of damage. 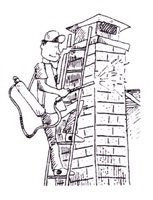 lf your entire chimney is wet it may be that the bricks are really soft or damaged. These bricks can act like a sponge, soaking up water that wicks to the inside. Often the moisture will trlckle down and into the home. Chimneys that are water soaked can also smell really bad. Applying a waterproofing coating such as ChimneySaver will keep moisture from entering your chimney yet will let the masonry breathe. lf moisture is on the inside of the flue, it can still "wick" to the outside. Moisture that enters in only certain spots may be indicative of deteriorated mortar joints. lf there are cracks, soft or damaged mortar joints, a professional can remove the damaged mortar and replace it. Waterproofing may be a good idea to prevent further damage. Sometimes it's tricky to pinpoint where moisture is coming in. lf there are cracks in the chimney crown (the concrete at the top), moisture can enter into the flue or outside of the flue. ln another situation, the chimney may be waterproofed but moisture can still be evident. This could be caused by an improperly vented gas appliance. Damage to the roof above the chimney may allow water to penetrate the roof. Then the moisture may follow the roof deck down to the chimney and appear as if the chimney was causing the problem. This is why it's important to have your chimney professional inspect your chimney for leaks. They are equipped and accustomed to accessing the roof and know the areas to inspect and how to troubleshoot leaking problems. They are also equipped and educated to fix problem chimneys. Catching the problem early will often save you money in the long run, avoiding the cost of extensive repairs or rebuilding the chimney. Be proactive and preserve your investment now. Reprinted, with permission, from the July 2011 issue of the Chimney Sweep News' an independent trade magazine for chimney service professionals. Jim Gillam, editor/publisher.